In this post I will be going down a rabbit hole inside only one, that being Law Nr 1: Eat Plants and Animals, the first of two laws regarding nutrition. It seems simple and easy enough, but if it were it’s unlikely that 72% of adults in the United States would be overweight or obese. 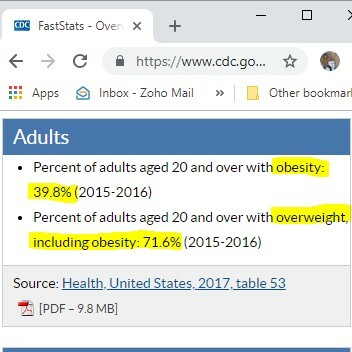 CDC FastStats Overweight and Obese. But you might ask, why focus on weight? There are many aspects of “health,” the physical, psychological, and emotional being just three that come immediately to mind, and inside of the “physical” are many additional layers of detail, but for now I will knowingly reduce health to the weight layer of the physical health aspect. 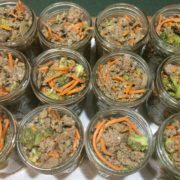 It is a gross oversimplification to be sure, but weight issues are one of the top reasons why people step up to dietary changes, so it’s as good a place as any to start. 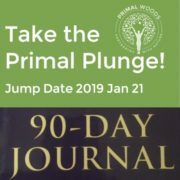 I included some stats on that “why” in my post, Primal Plunge – Primal Lifestyle: Why? Now clearly I am not alone in struggling with my weight, and just as clearly many if not most are losing the battle. In the chart above from the Centers for Disease Control National Center for Health Statistics, while the “overweight” categories for both men and women have remained relatively stable in size since the 1960’s, the “obese” categories have seen explosive growth for both men and women since 1976-1980. 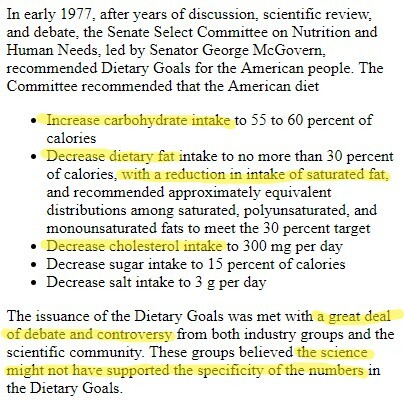 The “Dietary Goals for the United States” came out of the United States Senate Select Committee on Nutrition and Human Needs in 1977. “The science might not have supported … the numbers,” but regardless we commenced to run a nutrition science experiment on 220,000,000 people. Thus began the war on saturated fats and cholesterol. “Correlation is not causation,” but it is food for thought, pun intended. So what you say, we are overweight and obese, what’s that have to do with anything? It has everything to do with the fact that our Western diet is strongly associated with the so-called diseases of civilization. 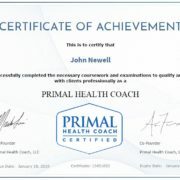 These diseases are sometimes also known as “non-communicable diseases.” Although now that I’ve written that I must add, while not “communicable” they are in fact “heritable,” which is to say we can pass on to our children and grandchildren, by virtue of epigenetics if not genetics, the “benefits” of our ill health. Let me show you your way on a short guilt trip. If you don’t care about your own health, fine, how about your future children’s health, or your future grandchildren’s health? It’s too late for those you’ve already brought into this world, except to the extent that if they change their lifestyle the generational cascade might be stopped. Perhaps you can act as a catalyst in that transformation. This first came to my attention in Nutrition and Physical Degeneration, by Weston A. Price; gift it to yourself or someone you love. 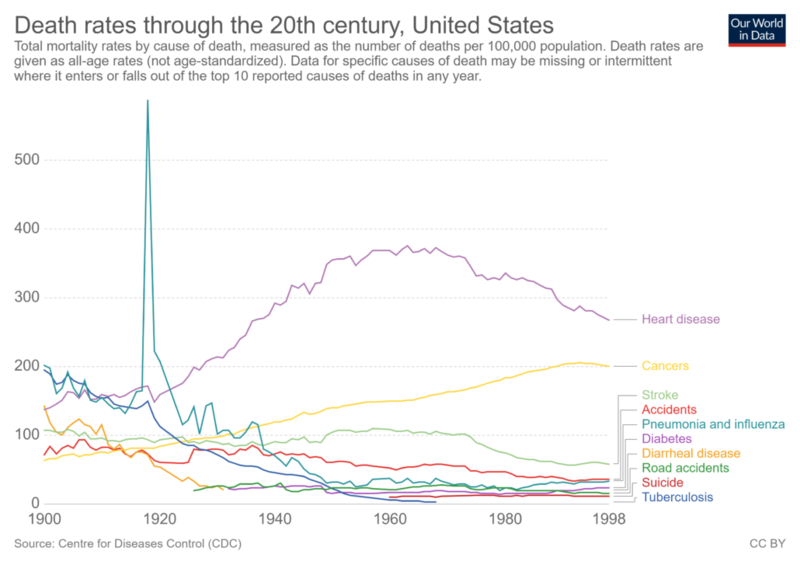 In the face of all of our advances in medicine, death rates due to cancers and heart disease in particular stand at more than the double the rates at the turn of the 20th century. And what are the associated risk factors? Funny you should ask. 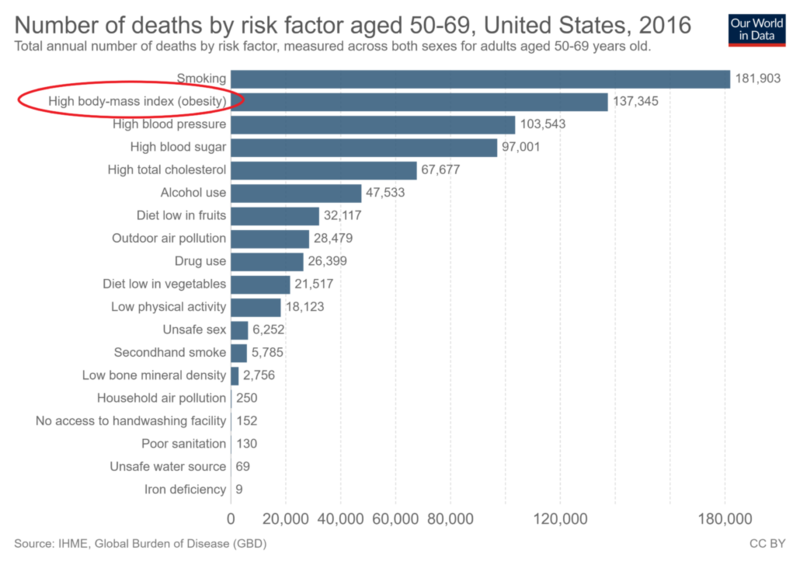 Our old friend Obesity, aka “High body mass index,” is the number 2 risk factor, second only to smoking as of 2016. Credit for both of those charts goes to Our World in Data, “Causes of Death,” by Hannah Ritchie and Max Roser, downloaded from the URL, 2019 Apr 11. Being overweight or obese is not only killing us as individuals, it is wreaking havoc on our healthcare system. ‘Nuf said, I’ll leave right there my attempts to convince you of the importance of achieving and maintaining a healthy weight. I Get It, Weight Is Important, Now What? Putting the puzzle together has been a 30 year project so far, from a state of being significantly “overweight” at a Body Mass Index (BMI) of 28.9 in the late 1980’s, to being back at a “normal” BMI of 23.1 today. As with others I’m sure, there have been innumerable wrong turns and ups and downs along the way. I’ve tried more diets than I care to enumerate, let’s just say “lots,” and until presently my personal rate of recidivism had been a rock solid 100%; it’s been a never-ending cycle of weight loss and weight gain. A search for “diet books” on Amazon yields “over 60,000 results,” so it’s safe to say that many people are very engaged in trying to reverse this trend, at least on an individual level. Eating triggers that are not hunger; social, psychological, etc. That’s a Lot to Consider. And? And two of those bullet-points are potentially addressed directly by the Protein Leverage Hypothesis: The first, sustainability of a way of eating, and the second, relative macronutrient and micronutrient proportions and amounts; carbohydrate, protein and fat in particular. To sustainability of the diet, how did hunter gatherers modulate their food intake? How did hunter gatherers achieve a species-appropriate macronutrient profile; hell, they didn’t know a macronutrient from a hole in the ground?! How does the lowly bovine manage to select appropriate minerals by “free choice?” We’re talking about cows here, come on man! You’re telling me that modern humans cannot manage these feats? I’m not believing it. industrialized populations, and metabolic and cardiovascular disease are rare. Obesity prevalence is very low (<5%), and mean body fat percentage is modest (women: 24–28%, men: 9–18%). Activity levels are high, exceeding 100 min/day of moderate and vigorous physical activity, but daily energy expenditures are similar to industrialized populations. Diets in hunter-gatherer and other small-scale societies tend to be less energy dense and richer in fibre and micronutrients than modern diets but are not invariably low carbohydrate as sometimes argued. 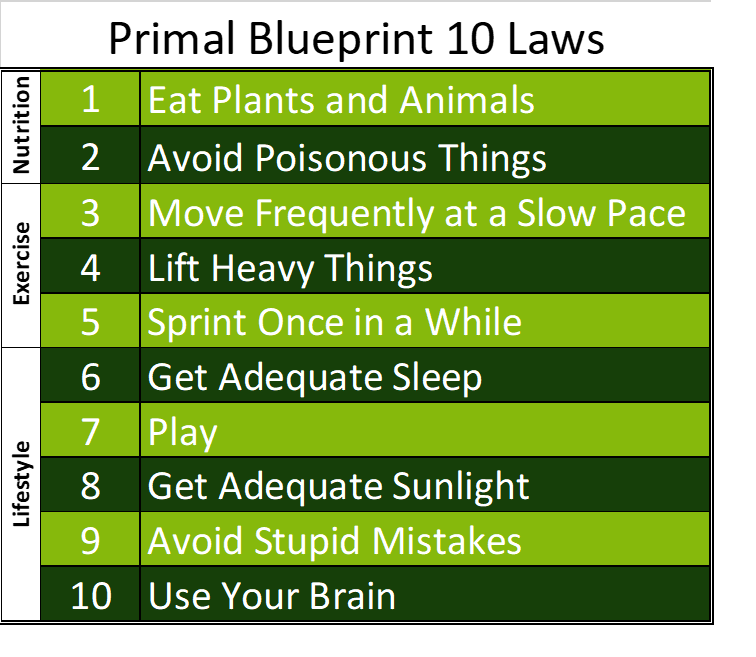 It’s really quite simple you see, move around a lot (Primal Blueprint Law Nr 3), and eat off the landscape you’re walking around on. Simple. But, have you had a look at the foods on our landscape? You see those three red arrows; none of those sources of energy were available to hunter gatherers. 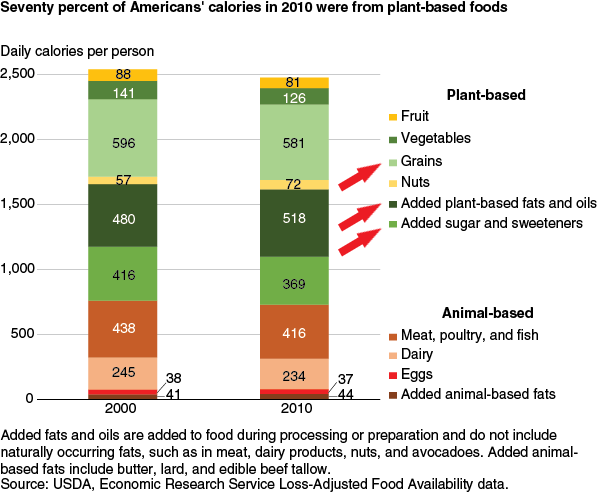 That totals up to 59.2% of the daily intake of 2,478 kcal in 2010; worse yet it’s 84.6% of the “Plant-based” calorie intake. So much for the inherent “goodness” of “plant-based” nutrition. This data is from the United States Department of Agriculture, Economic Research Service, “A Look at Calorie Sources in the American Diet.” While we may have adapted somewhat to these foods in the intervening 10,000 years, by the time you are somewhere between 30 and 50 years of age any adaptation has been outlived. In other words those foods were and still are foreign to our biology. See my post “Have We Genetically Adapted to Agrigultural Foods?” for more information. Most of us are not genetically adapted to 60% of the food calories available on our Western food landscape and that is a significant part of the problem. First things first, before we apply “protein leverage,” let’s do some landscaping. What has to go? Breads, cereals, baked goods, and anything made from grains, whole or otherwise; packaged foods and processed foods; heavily processed industrial seed, grain, and vegetable oils, as well as dressings and sauces made from them (mayonnaise, salad dressings); the “mindless crunchy snacks” that derail you in front of the TV at night; sweets, sugary drinks and sodas; frozen convenience meals, canned convenience foods; and just about anything that was made by man or produced in a factory. Simple, yes. Easy, no. If you need or would like help you’re welcome to sign up for the program, but for the sake of argument let’s say that you have “cleaned up” your immediate foods landscape. Congratulations! That’s a great first step. Our environment is still far more lush than our hunting and gathering ancestor’s might have been, but at least we’ve removed some, and perhaps most of what is offensive to our biology. There is still work to be done and choices to be made. If significantly overweight or obese you will enjoy a multitude of benefits by simply eliminating the junk foods, but your ultimate weight loss or body composition goals may yet elude you. This is where we pull the Protein Leverage Hypothesis out of the tool bag. In the rest of the book they attempt to bridge the gap between the “detailed” and “more general approaches” through the use of what they have termed the “Geometric Framework,” or GF for short. 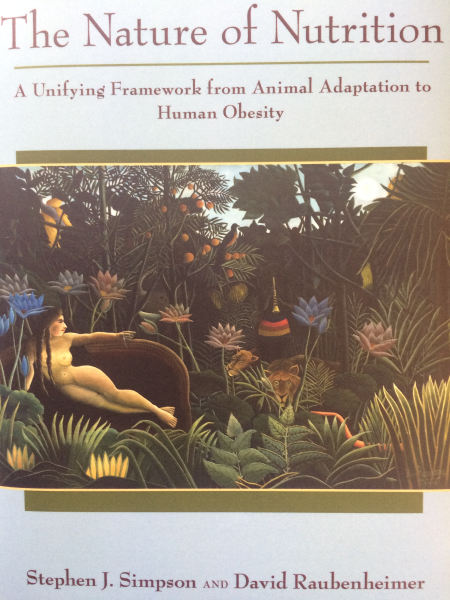 Simpson, Stephan J. and Raubenheimer, David (2012) The Nature of Nutrition: A Unifying Framework from Animal Adaptation to Human Obesity. Princeton, NJ: Princeton University Press. Core concepts of the Geometric Framework for Nutrition. The intake target represents the optimal amount and balance of the nutrients required by the animal. Radial lines are “rails” showing the ratio of the nutrients in foods, and grey circles represent hypothetical nutrient intakes (I1 – I5). As the animal eats it “moves” along a trajectory at an angle equal to the angle of the rail for the food it is eating (arrows), with sequential arrows representing intake trajectories. 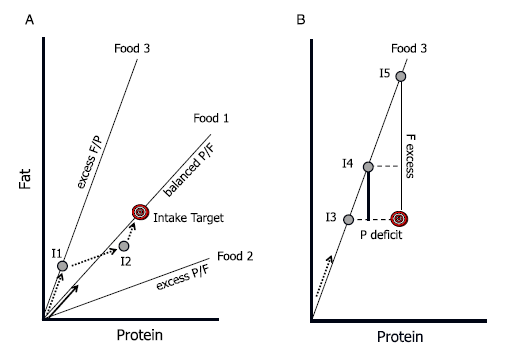 A) Food 1 is balanced with respect to the protein:fat ratio (P:F): it passes through the Intake Target, and thus enables the animal to directly reach the target (solid arrow). In contrast, Foods 2 and 3 are imbalanced (excess P and F respectively) and do not enable the animal to reach the target. It can, however, reach the target by mixing its intake from these “nutritionally complementary” foods (dotted arrows): for example, by first feeding on Food 3 to point I1, then switching to Food 2 at I2 switching back to Food3. B) If restricted to a single imbalanced food, the animal faces a trade-off between over-eating one nutrient and under-eating another. At I3 it meets its requirements for fat but suffers a protein deficit, at I5 it has optimal protein intake but excess fat, and at I4 it has both a moderate excess of fat and deficit of protein. The image above illustrates, as the caption indicates, “Core Concepts of the Geometric Framework for Nutrition.” Which is to say, this is pretty much as simple as it gets or as simply as the core concepts can be communicated. I’ve linked to the source article The example also happens to be almost perfectly “on point” with respect to this post. It’s pretty hard to be more concise than the caption, but I’ll try. Animals have evolved certain “nutrient needs” and the biological “mechanisms” to meet those needs. If foods are available in the environment that in any combination will meet the nutrient needs, the animal will find one or more of the combinations to meet the need, i.e. 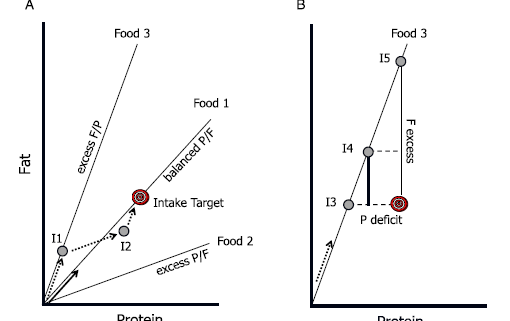 the “intake target.” This is represented in graph A, where the animal combines foods 2 and 3 to meet the need, or simply eats food 1, which as it happens contains the “target” protein/fat proportions. Conversely, if foods are not available in the environment that in any combination will meet the nutrient needs, in this case where foods 1 and 2 have been removed from the environment, graph B, the animal will behave according to a “rule of compromise.” In this example the animal overeats fat to avoid a protein deficit. The compromise is carrying around extra fat, presumably at some “fitness” cost, instead of operating in a protein deficit, and with the negative effects of the deficit. Basically the biology argues in favor of excess fat versus insufficient protein; the only two options in this example. Alarm bells should be going off in your head about now. In contrast to our changing nutritional environment, our physiology seems to have remained much more constant over the same timescale…the pace at which our nutritional environment has changed is considerably faster than the rate at which our metabolism can evolve: we are caught in a time lag, in which our physiology is poorly adapted to our lifestyle. We have been in a constant battle with our biology it seems, and we are losing if the United States level data that I’ve presented is any indication. The information presented by Simpson and Raubenheimer is compelling. The author’s lay the groundwork in Chapters 1-9, having as their subjects Cannibal Mormon Crickets, Locusts, Ants, and “The Blob,” aka slime molds. Then in Chapter 10 they take on human nutrition. How can we apply the Geometric Framework to better optimize our nutrition? 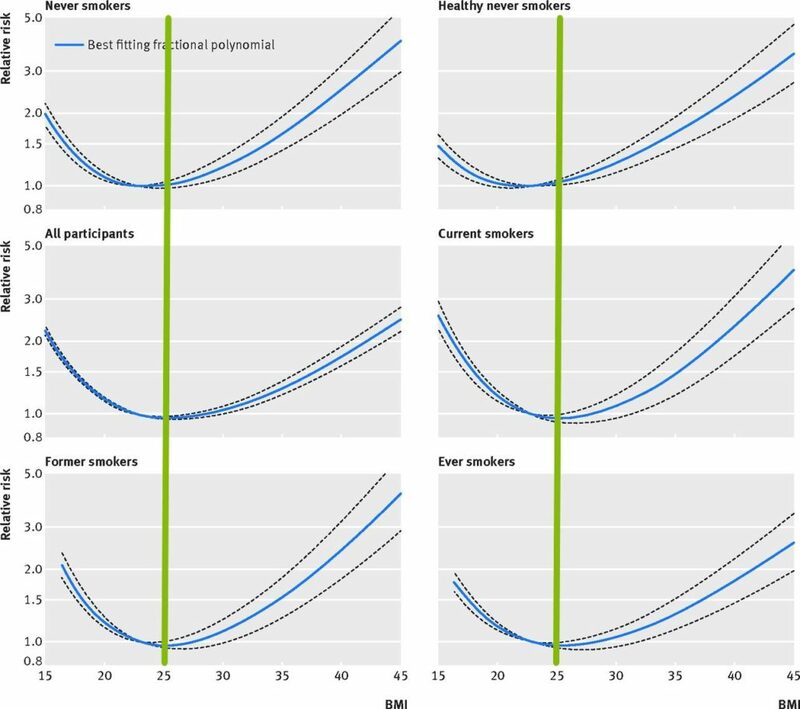 The low point on the curves to the left of my green lines, let’s say for “Healthy never smokers,” looks like a BMI of about 22.5; that is the optimum BMI relative to “all cause mortality;” in other words any leaner and things get worse, any fatter and things get worse. This is a condition to be sought and defended biologically; it’s a target. As it turns out the locusts defended a particular ratio of macronutrients (and by defend they mean that the locusts worked to achieve the target macrontrient ratio when feeding), and the chart suggests a great reason why we would, too; “Because doing so minimizes the risk of dying early.” Fruit flies and field crickets are reported to behave similarly. We’re in great company now, having added crickets and flies to our friends the locusts! A striking feature of the human diet is that the proportion of protein in the diet is highly consistent across populations and across time, comprising around 15% of total energy, whereas fat and carbohydrate vary. And not only the proportion of protein, but also the amount is consistent, at least in some populations. Finally, a relatively stationary target we can shoot for! (This goes directly to Consideration #9, relative macronutrient proportions.) But our regulation of nutrient intake is not perfect, and in fact between 1961 and 2000 the estimated protein share of our food intake in the United States has dropped from 14% to 12.5%, “away from the human intake target ratio.” Remember, that 12.5% is not simply a proportion, but also a specific amount of protein. If we are equipped with the “mechanisms” for getting back to target, how would we go about getting our amount of protein back on target? Let’s take me. I weigh 170 lbs more or less. Let’s say my calorie intake to maintain nutritional homeostasis at 170 lbs is 2,700 calories per day. Of that, the protein target that I am defending biologically is 14% (let’s at least get back to our 1961 protein intake) of total calories, or 378 calories. Protein comes in at 4 calories per gram, so the amount of protein I’m subconsciously seeking is 94.5 grams per day. Okay then, how many additional calories do I need above and beyond the 2,700 I’ve already eaten to get the additional 10 grams of protein? The 10 grams of protein is 40 calories, and 40 calories is 12.5% of the additional food I need to eat, which includes the 87.5% of carbs and fat combined. Those 40 calories are 12.5% of 320 additional calories that I need to eat! Now my biology has driven me to eat 3,020 calories to get to my protein target, while I only need 2,700 calories to maintain my nutritional homeostasis and body weight if the foods I eat contain 14% protein energy. What do you suppose is happening to those additional calories? Correct: I’m wearing them or I will be soon! Let’s look at the other end of the protein lever, the end that works for us versus against us. 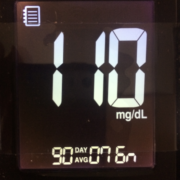 Some ten or eleven weeks ago I weighed 190 lbs. For the sake of argument let’s say I was eating that 3,020 calories per day diet, and 12.5% of that was from protein energy. I now know that I need 14% protein, but I’m going to push on the lever a little harder and consume 19% of my total calories as protein energy; this is in line with the low-end of what we think our hunter gatherer ancestors consumed. Okay, 19% protein is 574 calories of the 3,020, and it’s 143.5 grams of protein (that’s pretty damn close to what I’ve been doing actually). My biology says “whoa buddy, we only need 14% protein,” which is 423 calories or 106 grams of protein. How will my biology get me there? The difference is 143.5-106=37.5 grams of protein, or 150 calories. But again, that excess protein I’m eating is packaged with carbs and fat in the 12.5:87.5 ratio. The 150 calories of protein that my biology now drives me to avoid is part of 1,200 calories of SAD fare! At that rate I’d lose a pound every three days! In actual fact I lost 20 pounds in 70 days, or a pound every 3.5 days. The results of my “n=1” experiment over the past 80-some days now line up perfectly with what the Protein Leverage Hypothesis would predict. To manage my weight, all I should really need to do is hit my targeted protein amount; and my biology will take care of the rest. Yup, that’s right. 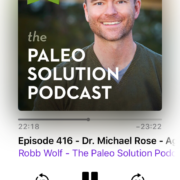 And that’s why I’m so excited about the mechanism of protein leverage, and using it to full advantage as I preferentially browse the primal fare that we keep around us. Of course I’ll pay close attention to all of the “considerations,” especially the triggers to eat when not hungry. But in essence, I’m now able to harness my biology to stabilize my body composition, as opposed to being unaware of why it varies so. As for me, I’m near my body composition goal, and so I will reduce my protein intake to at or near the “intake target,” causing my biology to relieve pressure on the protein lever and stabilize my weight by increasing the number of total calories I’m seeking. 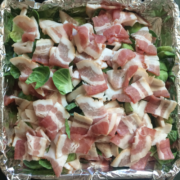 I will then experiment with the proportion of fats and carbs providing the balance of my energy and micronutrient needs to see what works best for me. As for my clients, I’m excited about the promise of protein leverage, and in effect the ability it gives us to harness human biology in our favor. With multiple 21-Day PTx programs in flight, I will be incorporating this information as soon as possible.